I started back into running in 2013, having not run since school. I was overweight and decided to set myself a challenge and lose weight at the same time. 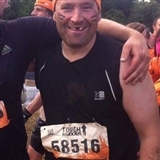 I entered my first 'Tough mudder' obstacle race. Several years later, and after many obstacle races, I decided to try running a bit more, so being sensible, entered a triathlon with a difference, instead of swimming there was stand up paddle boarding (which is another hobby!) and off road cycling and running. I've grown a love for trail running, and raced a few times off road. I hope to lead a few runs on trails, hopefully converting some people to the 'dark side'.